If you want to add your multiple twitter accounts to your mobile and if you manage more than 1 twitter accounts, we are going to tell you how to do that in here. Normally you can’t manage your Twitter accounts in same browser. We will introduce you an application which you can manage more than 1 accounts. This application is already suggestion of Twitter too.You can already use these applications for your notebooks and dektops too. If you want to use that application in your mobile phone it will be very easy for you. 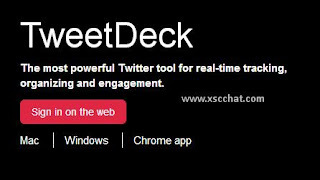 All you have to do is going main page of tweetdeck.com. This site has already adviced by Twitter about managing multiple accounts. Twitter allow their users to have more than an account. Click on Sign In button on the site and then create your account. If you have already an account you don’t need to register. You can log in to site directly. It will take your seconds to get an account in site. It’s just asking your mail address and your password. You can start to manage your accounts after you login to site. It’s all you have to do. It’s easy to use and free at all.